Look up Category:Korean language in Wiktionary, the free dictionary. Welcome to the Korean Wikibook, a free textbook for learning Korean. The boxes show Hangeul characters and jamo. If symbols appear as blank boxes, garbage, or question marks (? ), your computer or web browser needs to be configured for the Korean language. Korean is the official language of both the Democratic People's Republic of Korea (North Korea) and the Republic of Korea (South Korea). It is also one of the two official languages in the Yanbian Korean Autonomous Prefecture. Worldwide, there are about 80 million Korean speakers, most of which (outside Korea) live in China, Japan or the United States, but they also represent sizable minorities in Russia (esp. Far East and Sakhalinsk), New Zealand, Kazakhstan, Canada, Uzbekistan and Australia. In the Republic of Korea, the language is most often called 한국말 (Han-gung-mal), or more formally, 한국어 (Han-gug-eo) or 국어 (Gug-eo; literally "national language"). 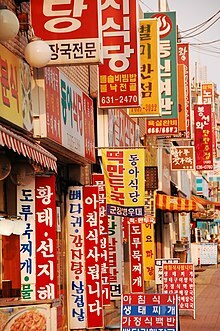 In North Korea and Yanbian, the language is most often called 조선말 (Chosŏnmal), or more formally, 조선어 (Chosŏnŏ). Experts are still not completely sure of the origins of the Korean language, although it is generally believed to come from the Altaic language tree. It is an agglutinative language, so it has some certain special characteristics that are unlike English. A student of Chinese languages will quickly notice that Korean shares much of their vocabulary, while a Japanese student will also notice similarities in grammar and vocabulary. Feel free to use English Wiktionary's Korean language Category as a reference for these courses. New students to this type of language may initially progress slowly, but as study progresses, previously unfamiliar aspects of Korean will begin to make sense and new concepts will be more easily learned. Korean grammar is complex but surprisingly also very simple, and always very fun to learn. 6. How much do you love me? This page was last edited on 8 September 2018, at 03:09.